Eddyville Raceway Park, one of the great historic tracks of the Midwest, has reached a multi-year sanctioning agreement with the International Hot Rod Association (IHRA). The track, located in Eddyville, Iowa, first opened in 1965. It has a glorious past with over a half-century of racing and presently features a strong IHRA Summit SuperSeries program. In the near future, Eddyville is scheduled to host the inaugural IHRA Midwest Summit Team Finals on Sept. 5-8, 2019. Located on 60-plus acres, ERP features a 1/8-mile drag strip along with several amenities for the racers including clean restrooms, showers, the best lighting in all of motorsports, camping and a kids playground. Sunoco Race Fuels are offered on site. "There are supporters of the Summit SuperSeries and then there are believers," IHRA Division Director Jon O'Neal said. "And then there's Gerald Kramer and the Eddyville family. They have embraced the Summit SuperSeries to the point where they are hosting an independent team finals event for the sole reason of spreading the IHRA Philosophy. That's dedication." 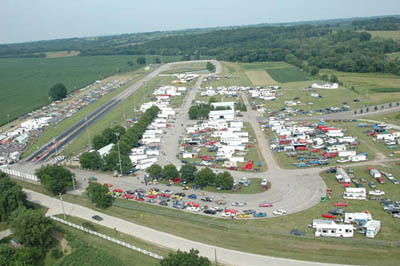 Open April through October, the track hosts a number of special events including the Midwest Nostalgia Nationals, the World Fuel Altered Nationals and its biggest event, the Night of Fire on the Fourth of July weekend. The Night of Fire includes Nostalgia Funny Cars, Top Fuel cars, Jet Cars, Wheelstanders and many more exotic machines. The core, however, is the sportsman racer and Eddyville is an ever-growing supporter of the IHRA Summit SuperSeries program. Terry Kruse (Top), Bob Bash (Mod) and Brandon White (Junior Dragster) were track champions in 2018. At the end of the season, the track has historically hosted the IHRA Midwest Jr. Dragster Halloween Nationals, which features four different age groups of racers with a King of the Track competition at the end. Eddyville Raceway Park was originally opened by John Rempe. He sold the track in 1993 to Carl Moyer, who expanded the pit area. Scott Gardner and Gerald Kramer purchased the track in 2006 and made more upgrades with Kramer becoming the sole owner in 2014. Through the years, the Southeast Iowa facility has remained a top venue for area racers. For more information about Eddyville Raceway Park events, click here for the track's website.